“Translation is not an innocent, transparent activity but is highly charged with significance at every stage; it rarely, if ever, involves a relationship of equality between texts, authors or systems.” These words, by Susan Bassnett and Harish Trivedi, highlight the politics that underlie the act of translation.<1> The choice, our choice, to make Ortiz’s writings available to non-Spanish-speaking audiences is, at its core, fundamentally about relational power. Without an English translation, texts, even foundational texts, are often relegated to regional status. Translation can thus simultaneously resist and support neocolonial hegemonies. Translation can provide access for the text and the author’s intellectual contributions to intervene into hegemonic discourse and can provide monolingual readers with a wider range of ideas and epistemologies, often disrupting colonial narratives in the process. Translation, of course, also always implies curation, and the choice of who and what to translate carries with it the power to canonize—or to erase. “If you see language as the process of meaning construction,” writes Gayatri Chakravorty Spivak, “The politics of translation takes on a massive life of its own.”<2> I want to discuss two aspects of these politics as they relate to translating the work of Cuban ethnologist Fernando Ortiz. First, I want to briefly touch on the dominance of the receiving language, English, and the relational power of the translator to rewrite, reshape, and reframe the source text. Second, I will consider how we view Ortiz’s source texts themselves. I suggest here that we should regard Ortiz’s ethnographic “originals” as themselves translations, employing both the cultural translation that is typical of the anthropological project as well as both intra- and inter-linguistic translation. Does recognizing the value and impact of Ortiz’s work and validating that recognition via translation imply agreement? As Robin Moore discussed in his 1994 article on Ortiz’s racial attitudes,<3> a topic that he expands in the introduction to our volume, Ortiz’s work can at once be informative and deeply problematic, providing detailed descriptions and analysis of Afrocuban ritual practice while simultaneously framing that practice with racist ideology, although his thinking did evolve towards a more nuanced view in later years. Could a translator, wishing to endorse the later, more racially progressive Ortiz, choose to employ translating strategies that downplay the writer’s more problematic allusions or linguistic constructions, thereby smoothing over his rough edges? Could a translator persuade herself that she is simply following Walter Benjamin’s admonition that the translator’s task is to find the intent of the original and to channel that intent into the translation?<4> Does it matter whether or not Ortiz “intended” to promote racist ideology? Take for example a relatively innocuous example such as the one below. Note how in the “smoothed out” translation I’ve removed the judgemental sensationalism of the original. Translating Ortiz is, in effect, rewriting Ortiz. Doing so in an annotated, scholarly edition, where we have the opportunity to clarify, provide background information, or add commentary, makes that rewriting even louder. I don’t think there is anyone on this project who was not aware of their situational power of holding Ortiz’s legacy, literally, in their fingers. How far should we go, for example, in “familiarizing” Ortiz’s text, rewriting him in words that put English-language readers at ease and, in so doing, underwriting their worldview? How should we handle Ortiz’s wide use of non-Spanish words in the original text, whether Yoruba, Efik, Bantu, or other African languages, Greek, or French? Where, for example, is the line between translator/rewriter/co-author? Are these identities always already merged? Where does my own identity as a scholar/writer come in? Ortiz documented his ethnographic essays with extreme detail. In winding sentences that stretch like tapeworms, he described the minute details of a costume, from the fabric, to the stitching, to the fit, to the ornamentation. Rather than resulting in a kind of Geertzian “thick description,” where the prose evokes experience, Ortiz uses detail as a form of scientific data, resulting in a kind of “listyness.” Rewriting these passages, I was faced with a choice. I could reproduce them to be as faithfully close to the original as possible, resulting in unfashionably rambling prose. I found myself worrying about my own identity as a writer. If the prose is ugly, would I be blamed for creating a “bad translation?” I could, I reasoned, dissect such winding descriptions into discrete parts, allowing the smaller sentences to focus on elements of detail in a way that would be more engaging to contemporary English-language readers. Generally, this is a tactic that all of us have used at times throughout the text, and such revisions deliver a prose that is much more accessible to contemporary English-language readers. I did notice, however, that such rewrites had the potential to recast Ortiz’s scientific detail into something that felt more like thick description, a change that not only alters the flavor of Ortiz’s text but could also reposition it in relation to other early twentieth century anthropological writing. Altering Ortiz’s narration to feel more like description than data could have the effect of distancing him from his scientific-minded brethren and moving closer to the “rustling of the leaves” school of ethnographic writing led by female ethnographic writers of his generation, such as Margaret Mead and Ruth Landes. Could my translation re-genre the text? Could it re-gender it? Translating Ortiz is complicated further with the realization that Ortiz’s texts are themselves translations. On the most basic level, Ortiz’s writings are, like all ethnographic texts of outside cultures, translational. As ethnomusicologists, we are constantly translating, translating cultural practice into a condensed linguistic description that will be legible to nonacculturated readers, translating between musical and linguistic signs, and, in many cases, translating language—in the field, in analysis, and later, on the page. Ortiz’s work utilizes translation in all of these respects. As an educated, multi-lingual, cosmopolitan member of the white Cuban elite, Ortiz’s writings translated Afrocuban cultural practice for his readers, describing ritual and its intent and unpacking the meanings generated by visual, sonic, linguistic, and gestural signifiers. Ortiz translates the metaphoric ritual practices of the Afrocuban secret society, the Abakua, through powerful metaphors of his own. Ortiz’s essay, “The ‘Tragedy’ of the Ñáñigos,” is, in effect, one such metaphor, as Ortiz reframes the elaborate initiation ritual of an Abakua novice through the lens of Greek tragedy, comparing the sacred mystery at the rite’s core to the ancient Eleusinian mystikos sekos. This kind of translational metaphor exerts its own kind of power. In instructing readers to reconsider Abakuá tradition alongside the ancient Greeks and Eleusinians, Ortiz moves away from his earlier primitivist descriptions and instead appears intent to elevate white readers’ understanding of Afrocuban culture, a project that runs throughout his later work. At the same time, such a metaphor serves to justify Abakuá practice through a geneology that links it to classical civilization, effectively shifting the source of its meaning and of ritual intent out of Africa. Ortiz is not just translating culture, however. He is constantly engaging with linguistic translation. 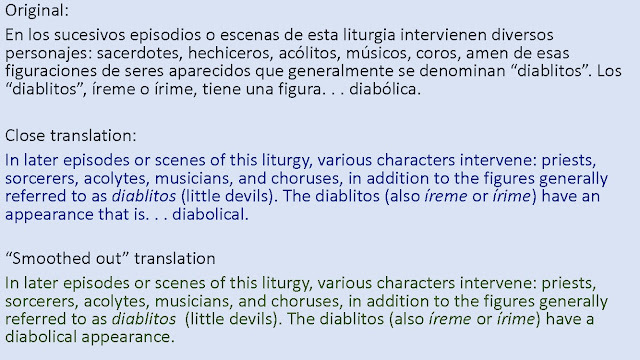 At the most basic level, Ortiz’s work is full of inter-lingual translation, or what Roman Jacobsen refers to as “translation proper,” in which he interprets verbal signs from another language (usually from a West African language group) into Spanish.<5> As Robin Moore points out in the introduction to our volume, Ortiz himself was aware of the power of this interlingual translation and its potential for misuse, a realization that appears to have been heightened, if not precisely caused by published conversations between Ortiz and his former protégé Romulo Lachatañaré regarding the politics of using the Spanish word “brujo” (sorcerer or witch) to describe religious practitioners. Ortiz uses visible inter-lingual translation in multiple ways throughout his essay. 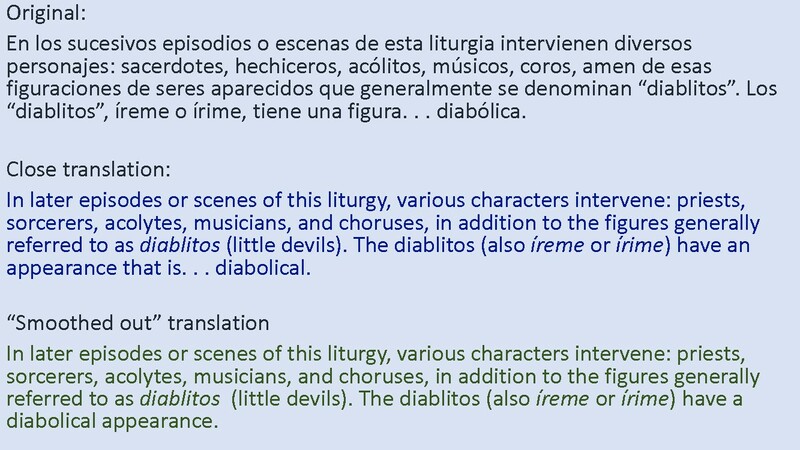 In some cases, such as the use of “brujo” or “diablito” (little devil) to describe the masked Abakuá ritual figure, or írime, Ortiz seems content to utilize the Spanish term (however problematic) commonly in use at the time. Francesca Orsini and Neelam Srivastava refer to this kind of translation as “domestication,” in which the translation serves to rewrite culture in a language that confirms the belief system of the reader.<6> More often, however, Ortiz makes the translation visible, italicizing the source language and providing a translation in the accompanying prose. At times, he may further highlight the interlingual translation by identifying the linguistic origins of the source term. Ortiz also practices intra-lingual translation, translating idiomatic terms or phrases in Spanish that pertain to colloquial practice. These terms he puts into quotation marks (see above). The linguistic markedness that Ortiz supplies via italics and quotation creates a tension in his text between a recognition of the autonomy and authority of the source culture—using its own words--and a defamiliarizing translational practice that highlights the Otherness, and ultimate untranslatability, of that culture. One of the first decisions we made as a team was to “clean up” this aspect of Ortiz’s copy. We chose to follow contemporary editorial standards and to only italicize foreign words on first usage. In almost all cases we removed the quotation marks from Ortiz’s citations of vernacular speech. In hindsight I am ambivalent about this decision. It definitely increased the accessibility of the text, creating fewer visual distractions and subtextual references. By removing Ortiz’s references to his own position as translator, however, this decision increased Ortiz’s authorial power over the narrative, removing the textual awareness of his own positionality as a cultural and linguistic outsider. For me, reflecting on my own work translating and rewriting Ortiz has been a humbling process and one that has left me deeply ambivalent about some of my own choices. It is an experience not unlike that of reflecting on the choices made when writing ethnography. I am comforted, somewhat by Basnett’s and Trivedi’s reflection that “translation does not happen in a vacuum, but in a continuum; it is not an isolated act, it is part of an ongoing process of intercultural transfer.”<7> Such a view reminds me that this work opens, rather than closes, a conversation, a conversation made much larger by the translation itself. <1>Bassnett & Trivedi, Post-Colonial Translation (Routledge, 1999), 2. <2>Gayatri Chakravorty Spivak, "The Politics of Translation," in Mieke Bal, ed., Narrative Theory: Critical Concepts in Literary and Cultural Studies vol. III (New York: Routledge, 2004), 140.
of Fernando Ortiz,” Latin American Music Review 15, no. 1 (Spring/Summer 1994): 32–54. <4>Walter Benjamin, "The Task of the Translator," in Selected Writings: Volume 1, 1913-1926 (Cambridge, MA: Belknap Press of Harvard, 1996 ), 253-63. <5>Roman Jacobsen, “On Linguistic Aspects of Translation,”  in Lawrence Venuti, ed., The Translation Studies Reader (London and New York: Routledge, 2000), 113. <6>Francesca Orsini and Neelam Srivastava, “Translation and the Postcolonial,” Interventions: International Journal of Postcolonial Studies 15/3 (2013): 323-331, p. 327. <7>Susan Basnett and Harish Trivedi, Post-Colonial Translation: Theory and Practice (London and New York: Routledge, 1999), 2. Susan Thomas is Professor of Musicology and Women’s Studies at the University of Georgia and is also a member of the editorial team at Musicology Now.